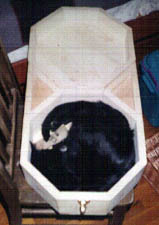 The Cat Coffin - "Chewbaccophagus"
In 1994, Jo-anne Foley, then Jo-anne Foley-Kennedy had a very old cat on her hands. She loved Chewbacca, and had owned him since 1976. Chewie was receiving fluids intravenously and was not going to see another spring. Jo-anne asked me to craft a cat coffin for him, something nice. 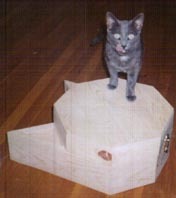 I designed and built a cat-face-shaped box out of pine. The lid hinged open and dropped between the ears. Chewie passed away soon after the box had been completed. Chewie fit into the box curled up, ready for eternal sleep. I was about a million dollars in debt at this time in my life, so I wanted payment quickly, I calculated a bill and sent out an invoice under the name of Cockerham Cryptworks for product 00100, the Chewbaccophagus. Jo-anne, in her infinite comedy, set me a very large green check. I didn�t want my check to come back with returned check charges, so I went to her bank to cash it. The bank tellers were dumbfounded for a bit, but they arrived at a conclusion: The check was a photocopy of a check, and so it was no good. I hunted Jo-anne down, and she was very disappointed, but she paid me cash.